You've heard it before, and I'll say it again....Cora Carmack has been a favourite author of mine ever since I first read LOSING IT. I remember being part of the blog tour for Losing It when Cora Carmack was still a self-published author, and thinking, "People NEED to read this book!" Today being on her blog tour for All Lined Up sort of feels like coming full circle. Now, Cora Carmack is a bestselling new adult author and published by William Morrow Paperbacks....witnessing growth in authors like Cora is an exciting part of book blogging that I never realized I'd experience when I started, and let me just say, I'm loving it! I'm writing this review just minutes after putting All Lined Up down, and all of my thoughts are in shambles of excitement! All Lined Up is a novel that has a large focus on football. I personally would not consider myself a huge fan of the sport, and if I'm being quite honest, the little knowledge I do have of the game comes from watching movies like A Cinderella Story (you know, that version starring Hilary Duff?!? )...and again, if I'm being completely honest, I was mostly distracted by Chad Michael Murray's insane good looks in that football uniform. Can I say, Yum-my?! Anyhoo, my lack of knowledge of the sport did not at all effect my enjoyment of this story. In fact, I think it added some excitement! For me personally, the book brought out that feeling you get before a game starts; you're stomach is in knots, everything is tense, and all you're hoping for is for your team to come out with a win! Cora Carmack managed to bottle this exact feeling up whenever Carson's team was playing and I loved the rush! 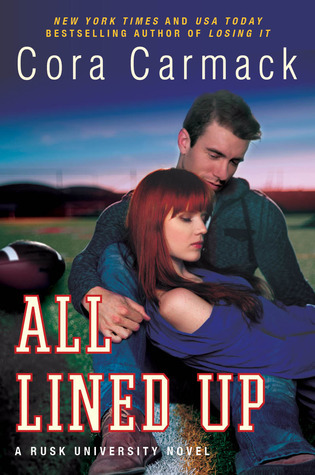 All Lined Up wouldn't be a Cora Carmack novel if it didn't have a sweet and swoony romance! The relationship between Dallas and Carson starts off blazing, but they quickly run into issues concerning the fact that she's the football coach's daughter, and he's a member of the team. As a result, they both try resisting each other, but as you may already guess, they fail. Although their relationship starts off hot and heavy, they do carry it forward at a more slow (but still intense) pace that makes the way the novel ended absolutely perfect! Dallas and Cole had incredible chemistry, and what I probably loved most about them was how they really found themselves by being together-- Dallas with dance, and Carson with football. Another star quality about All Lined Up is that it's not just a romance novel; it also focuses on Dallas building a better and stronger relationship with her father (who at the beginning of the book, plays a very controlling role in Dallas' life). Character growth is a huge part of what makes a book/series so good in my eyes, and there's plenty of growth in this book to make you feel like you took an important journey with all of its characters. Overall, I unsurprisingly really loved All Lined Up! It had a bit of that quirkiness I always enjoy reading in Cora's books, while still having an identifiably different voice than her Losing It series. Being able to read from both Dallas and Carson's POV from beginning to end allows readers to connect with both characters strongly, and the well-timed pace makes it a fast read! Whether you've read Cora Carmack's books in the past or not, All Lined Up is worth checking out! I'm excited for the next Rusk university novel to come out in the fall....I'll be patiently waiting until then :P Have you read All Lined Up? What is your favourite Cora Carmack book? Be sure to let me know in the comments below! Keep Reading!